Ford’s heavy duty F series trucks remain the industry’s best selling automobiles in the US, with the F-150 model being the best selling truck for the past three decades. 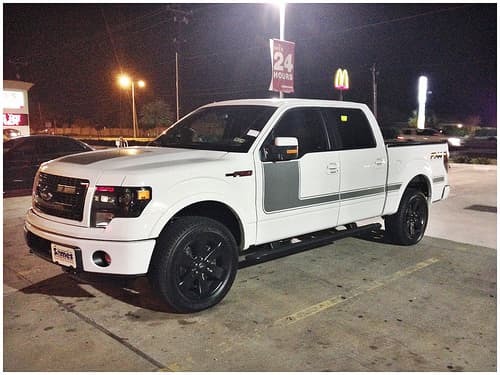 So, it makes sense that the world would be awaiting the birth of their latest addition, the new F-150 model. News of the new arrival came as Ford, literally, dropped the news of its expectancy from the sky at the 2013 Detroit Auto Show. 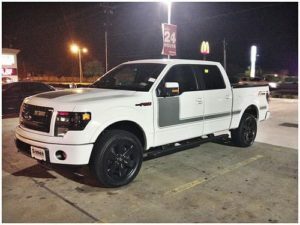 It’s unclear rather this new addition will have a 2014 or 2015 birth date, but whenever its birth date, the many promising features the new F-150 is said to offer, makes it well worth the wait. Named “The Atlas”, the new F-150 concept model features a lighter frame and greater fuel efficiency. According to Ford, the new model has been modified with an unspecified lighter frame material to cut weight and increase fuel economy. But, you don’t have to know what the frame is made of to appreciate its rugged, but oh-so-stylish design, and primitive grille that growls to reinforce its territory on the road, which makes it just perfect for work or play. However, rumor has it, its new body will be made of high-tech aluminum. According to a Ford’s spokesperson, the Atlas provides plenty of advantages over its competitors the Chevrolet Silverado and the GM series trucks. Some of these advantages include an ECO Boost V-6 engine that packs more power than the Ram V6 and wind resistant features such as a front air damn that instinctively adjusts its height according to the speed and grille shutters that close to provide comfort to an over-cooled engine. The new aerodynamic features also include wheel shutters that deter air flow from between the spokes, brakes, and suspension components for a smooth, reassured ride. Ford’s Vice president of engineering concludes that this is just the tip of the iceberg in where Ford plans to go in their development of its future F series offspring. Further research into aero design as well as weight trimming methods, and more, will continue to be the focus of the future of their legendary F series pick up trucks. Ford’s line up F-150 series trucks is said to include over 10 different new models. Other features of the F-150 include a navigation system, business search, hands free calling, voice music control, rear view camera, quiet environment, safety cage, in cab storage, and more.